One of the most worshipped deities in the world is Kuan Yin (also spelled Kwan Yin, Guan Yin or Quan Yin). She is known as the "Mother of All Compassion", the "Goddess of Mercy" and the "One Who Hears The Cries of the World". Kuan Yin has been worshipped for thousands of years and is revered for her unconditional love, compassion and mercy. She is regarded by many as the protector of women and children and is also seen as a fertility goddess capable of granting children. She is also the champion of the unfortunate, the sick, the disabled, the poor, and those in trouble. She is a Boddhisattva (also spelled bodhisattva), a person who has earned the right to leave this world of suffering and enter Nirvana, but instead has chosen to stay on this earth to help others reach enlightenment first. Because of her willingness to help, Kuan Yin is the patron saint of barren women and protects those whose lives depend on the elements, such as farmers and fishermen. Among business people and traders, she is looked upon as a Goddess of Luck and Fortune. In recent years she has been known to be the protector of air travellers. 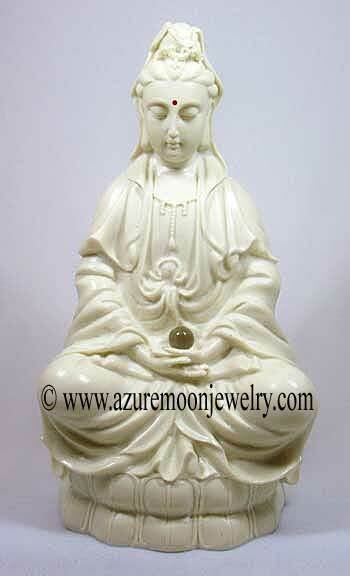 Seated in the Lotus Position and in deep meditation, this beautiful and serene Kuan Yin statue was cast in China from faux Ivory colored polyresin to resemble natural Ivory. She comes with a 14mm clear crystal ball for you to place in her hands. 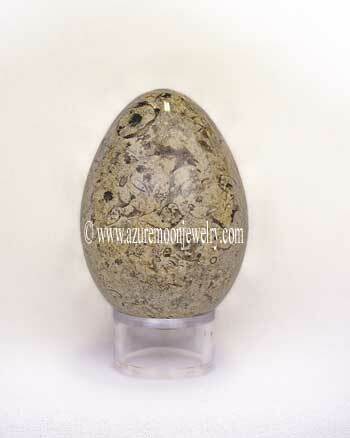 She is an exquisite, meaningful and peaceful addition to any home or office. It is best to place her facing the main door, but she can also be placed in your living or family room, meditation or healing room, on a shelf in the Southwest of your bedroom, or anywhere to bring harmony and compassion to your home. She must never be placed low, or on the floor as it is very disrespectful to her (and all deities) and she must never be placed in the bathroom or kitchen. Measures 12" H � 6 1/2" W � 4 3/4" D.